After watching his teammates Dillon and Darren Harris compete for state titles of their own at the WIAA Mat Classic, Yelm High School senior Anthony Allred had a chance for state glory as well. However, like Darren Harris, Allred came up short, and finished second to Mead’s Tyler McLean in the 160 lbs. weight class of 4A. Allred finishes the year a remarkable 37-8, and ends his career as a state placer at the 4A level. Down 4-3 with less than half a minute left in his title match, 145 lbs. wrestler Lucas Eastman, a sophomore at Rochester High School, knotted things up at four a piece, and the match went to a an extra, one-minute period. However, in the 1A title match against Roberto Orozco of Connell High School, Eastman was taken down in the extra session, and finished in second place at the WIAA Mat Classic at the Tacoma Dome. It was the best Warrior finish this year, and Eastman will have two more years to earn a state crown. To go undefeated in a high school wrestling season, you must literally be the last person standing. Stone Hart, the 220 lbs. 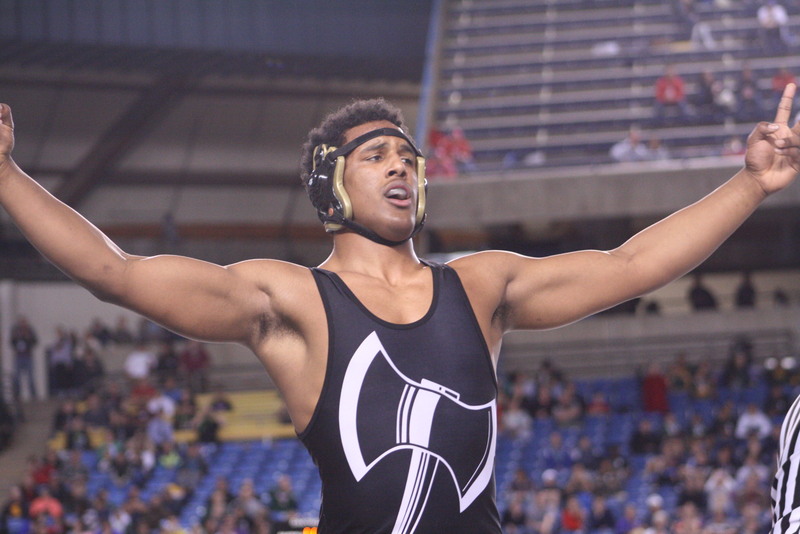 wrestler for 3A Timberline High School, finished the season 33-0, and won his second consecutive state title at the WIAA Mat Classic in the Tacoma Dome. Hart defeated Tom Harvey of Mt. Spokane in the final in dominating fashion. It was a match-up of two defending state champions, and in this clash of the titans, Darren Harris of Yelm fell a little short. Harris, a sophomore, won the 3A state crown at the 2012 Matt Classic in the 106 lbs. division, and this year he fell to Noah Cuzzetto of Edmonds-Woodway, who won the 4A state title at 106 lbs. in 2012. Controlling the match for the majority of two rounds, Harris was pinned in the second round by Cuzzetto. A three time state placer prior to the 2013 WIAA Mat Classic, Yelm High School senior Dillon Harris can add state champion to his already impressive resume. Harris defeated Joshua Smith of Kent-Meridan High School to take home the crown in the 4A 138 lbs. division. Harris won by takedown in the second round, showing strength and determination throughout the match. He finishes the year 31-3. Down in points the majority of the match, Tumwater High School senior wrestler Jose Jimenez made a remarkable comeback in the final seconds to win the 2A state championship in the 220 lbs. weight class. Jimenez defeated Jace Malek of West Valley High School 9-8 to take home the crown at the WIAA Mat Classic in the Tacoma Dome. Tumwater High School senior wrestler Cameron Nolan had a tough match-up in the 2A 132 lbs. title match during the WIAA Mat Classic. Going up against Cole Harris of Deer Park High School, the defending state champion in the 126 lbs. weight class, Nolan fought hard, but just couldn’t grapple past to become a champion. In a match that went all three rounds, Nolan was defeated. However, the run to the title game was impressive for the T-Bird wrestler, and he can walk away from the Tacoma Dome knowing he gave it all.